There is no doubt about it, parenting can be a tough business and let’s face it; when your baby is having hard time teething, there is sometimes little to smile about. Every baby is different. Some babies will not exhibit any signs of discomfort at all and will one day simply display a shiny white tooth in an otherwise gummy looking smile, whilst others baby’s will let you know about it! For example, they could dribble more than usual, want to chew on everything (and everyone! ), not eat as much as normal and have sore gums. 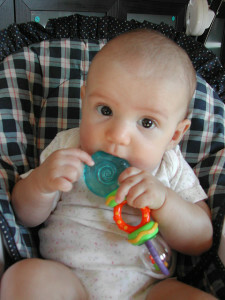 So what can you do if your baby is having a hard time teething? Dish out the cuddles, your baby will look for you to make things better and although you won’t literally be able to kiss it all better, they will feel reassured by your comforting presence. It will help soothe your baby if you rub their gums with a clean finger, just watch out that they don’t mistake your finger for a teething ring! Ouch!! If you have a little dribbler ( and we are not talking footballers here!) it is very important to keep your baby’s neck and chin clean and dry, to avoid soreness and chafing. You will also want to keep their clothes nice and dry, so try using a bandana bib like the ones from Funky Giraffe. They have a huge range of designs to choose from ( over 300!) and are suitable for babies and children from 0-3 years old. If you find your baby’s skin is getting red use a barrier cream. Look into natural pain relievers such as vanilla extract or natural licorice sticks. These can be found in some health stores. If you are not sure what you can use, always seek advice from a health professional. Make sure you look after your baby’s teeth once they do come through. You can start by using a soft brush with a small head. If you find your baby wants to grab the brush off you all the time, maybe have a second one to hand which you can use, whilst they are also “brushing” their teeth! Never let your baby walk around with the brush though as this could result in an accident. It is never too early to register with your baby with your dentist. Get into the habit of offering your baby water in between feeds, rather than juice and by the time baby is six months old you should be encouraging them to drink from a cup, rather than a bottle. Remember the teething stage doesn’t last forever and your baby will soon be flashing you a wonderful toothy smile!